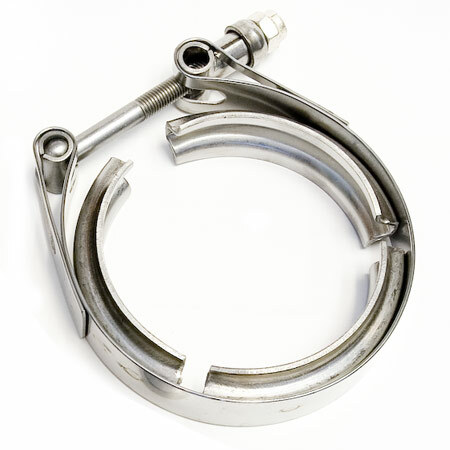 Heavy duty stainless steel V-band clamp for industry standard 3" turbine housing outlet (down-pipe) V-band flange. Constructed from stainless steel material. Recommended clamp for industry standard V-band outlet (down-pipe) flange with a 3" inner diameter and 3.75" outer diameter. ** Alternate clamp available for Garrett GT 3" V-band flange with an outer diameter of 3.55" (Additional +$7.00). * Industry standard 3" V-band flanges include a 3" inner diameter, 3.75" outer diameter, and supports pipes with a 3" outer diameter. * Compatible with industry standard v-band flanges with an outer diameter of 3.585" to 3.75". * Alternate clamp available for Garrett GT 3" V-band flange with an outer diameter of 3.55" (Additional +$7.00).